Happy Day After Thanksgiving! We hope you and yours had a wonderful holiday. 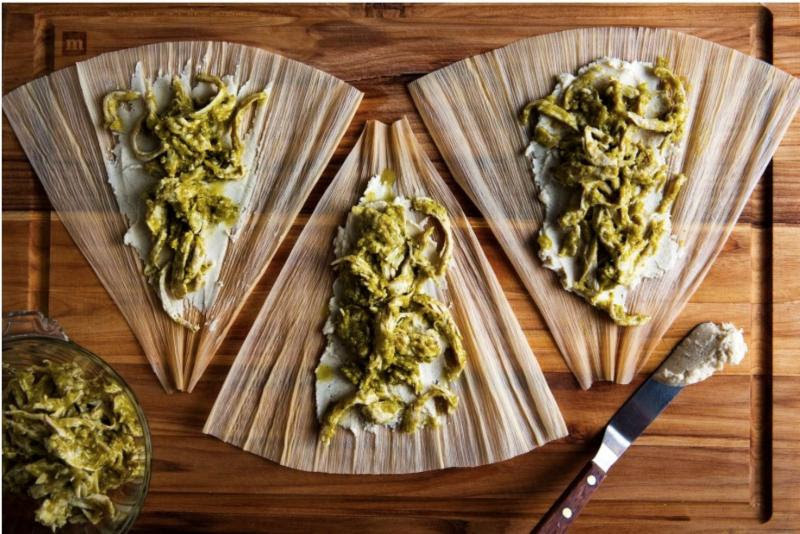 In our commitment to helping you be lazy today, we present our second annual Thanksgiving Leftovers issue of TLV. Nurse your Thanksgiving feast hangover with what we hope are some interesting bits and, at most, some soft news. Nothing hard - we'll leave that to your nightcap. "Leisure is the time for doing something useful. This leisure the diligent person will obtain the lazy one never." What do microwaves, penicillin and Corn Flakes have in common? Each of these discoveries is among some made by accident. In 1945, a melted chocolate bar in the pocket of an engineer working on a radar-related project would spark the idea for the microwave. A vacation would allow mold to grow in Alexander Fleming's petri dishes, which would lead to the fateful discovery of penicillin. John Kellogg accidentally overcooked wheat when he was attempting to find wholesome foods for the patients of the sanitarium where he worked. The result, which he later replicated with corn, was a dough that could be separated into flakes. The recipe for Corn Flakes was born, as was a massive brand. Follow the link for many more accidental, world-changing discoveries. 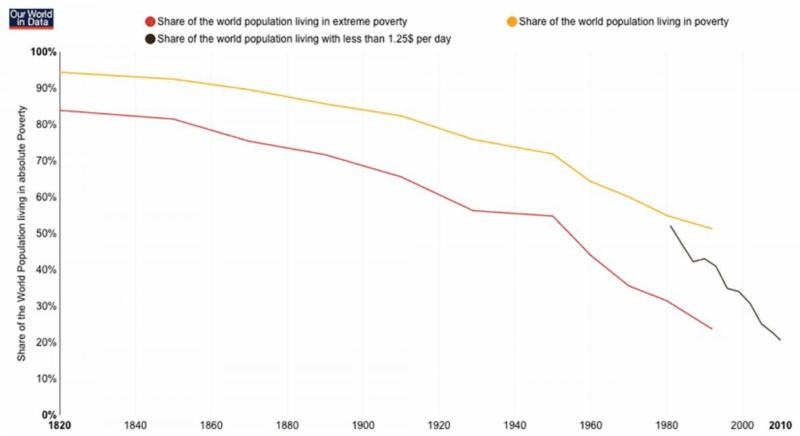 An economist put together a series of charts reminding us that despite all the bad news we hear, people have never been better off. Conflict-driven violent and war casualties have dropped dramatically. Worldwide GDP growth is reducing global inequality. Famines are virtually nonexistent. Follow the link to see the full collection of good-global-news charts. Select examples follow. The Human Development Index, which is measured in terms of length of life, health, education level and standard of living is on the up and up around the world. 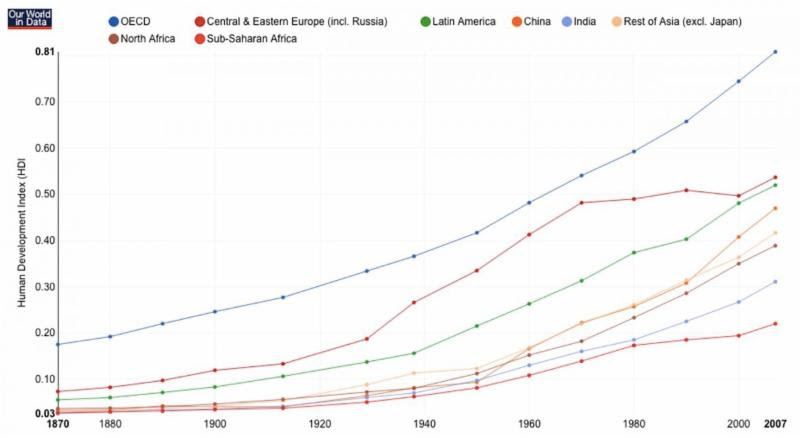 Extreme poverty has dropped precipitously in the past 100 years. 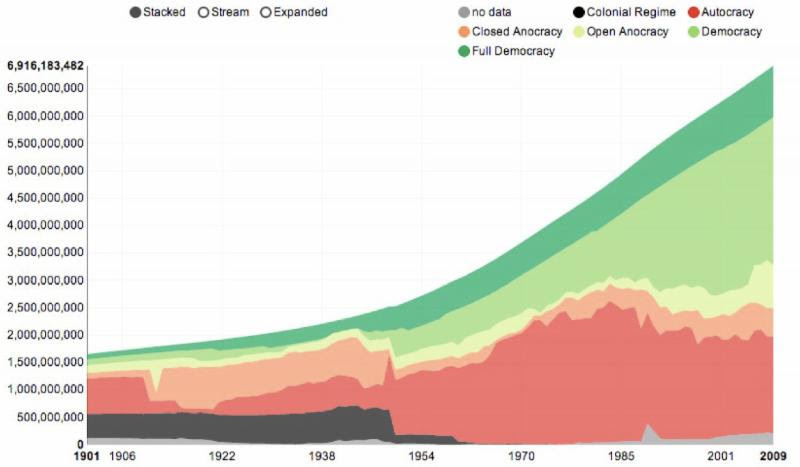 The quotient of people living under a democratic government has risen sharply since the mid-1900s. Bad news: We've all been misled about eating fat. Good news: We've all been misled about eating fat! Several recent studies corroborate that a diet high in dietary fat - the saturated fats found in meat, cheese and butter - and low in starchy carbs leads to weight loss, improved cholesterol and lower risk of all sorts of disease. This theory has been slow to gain traction because we're so programmed to believe that fat grams and excess calories cause weight gain. Rather, it's the quality of the calories and how your body uses them. Calories from dietary fat do not affect insulin levels and instead force the body to burn fat for energy. Whereas starchy carbohydrate calories cause the release of insulin, which converts extra blood sugar into fatty acids stored around the body. Drown that steak in butter and smother your veggies in cheese. The crowning cities in America have shifted since our country's birth. New York and LA were the jewels of the 20th century. However, plenty of data show that Houston and the Bay Area are competing for the one-spot in the 21st century. As the leader in technology and venture capital, Silicon Valley has replaced Wall Street as the most desirable post-college career destination. Defectors from NYC to the Bay Area are at an all-time high. Digital media out of the Bay Area is threatening LA and NYC's long-time media stronghold. Houston, on the other hand, has an overwhelming corner on the energy industry, with more than 5,000 energy-related companies calling it home. Since 2000, Houston's employment has rocketed up 32%, compared to 4% in the Bay Area. Houston also has the nation's largest export port and has become the most ethnically diverse metropolitan area in the country. Which city will become America's crown jewel of the 21st century and what factors could be at play? Read on for perspectives. 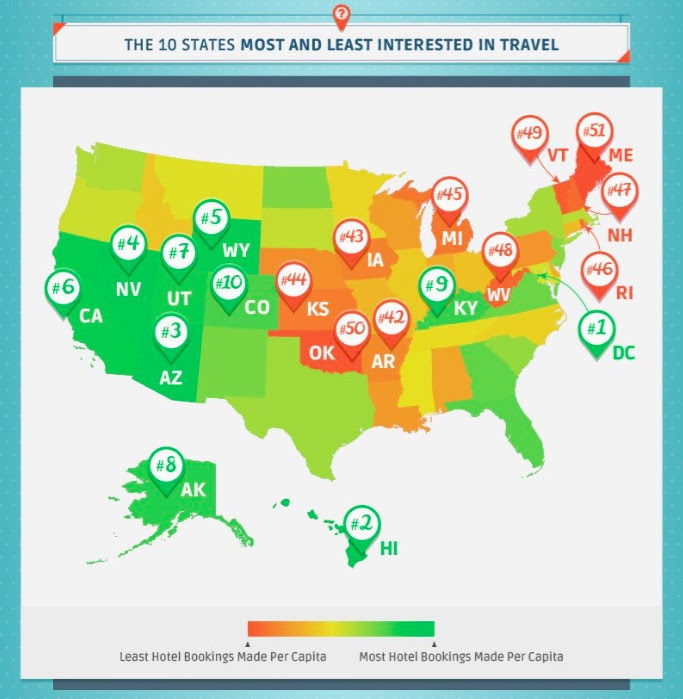 A hotel booking site gathered data on Americans' travel patterns within the country. Follow the link for the full infographic. A selection of findings follow. Texans both love to travel and play host to droves of tourists. 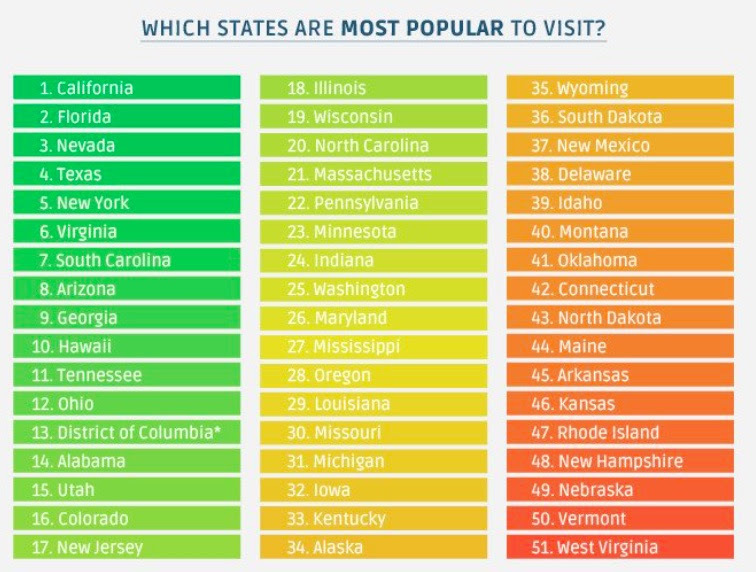 Texas comes in strong as the 4th most popular tourist destination. Maine-iacs are content to stay put. Those from D.C. love to skip town. Most Texans pack their bags for California, while Californians appear to have a penchant for Vegas. 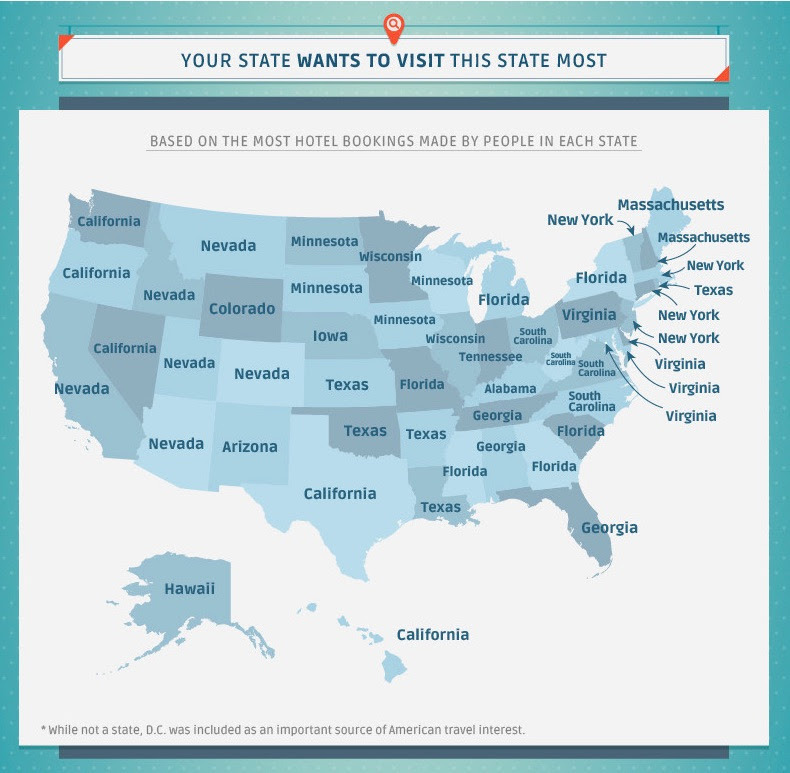 Travelers from several states are frequent visitors to Texas. In late October, a teenage girl from Britain randomly found a Tumblr photo of a teenager from Frisco, TX named Alex Lee. Thinking Alex was cute, she posted the photo via her Twitter account. Within minutes, #alexfromtarget (Target being where the teen works after school) was a Twitter trending topic. Within a day, his Twitter follower count had swelled from 144 to over 100,000 (and it's now bumping up against 1 million). What followed was an appearance on "Ellen," multiple interview requests, paparazzi, sponsorship offers, even death threats to his family. Read on for a fascinating look into the strange power of modern Internet fame - even unsolicited - and all its trappings. When standing up straight, our spines bear the actual weight of our 10 to 12 pound heads. The more we crane our necks, the more gravity pulls on our head and increases the weight our spines must support. 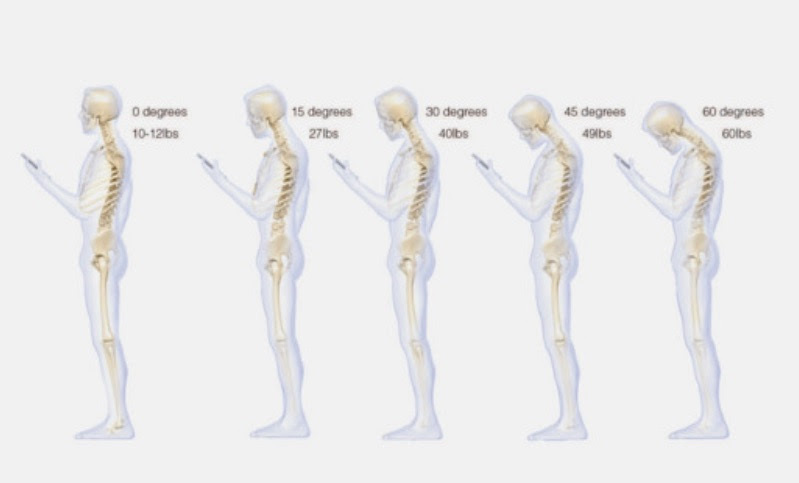 A 60-degree tilt of the head - the full Smartphone Tilt - translates into 60 pounds of weight on our spines. Such stress over several years could land you on the operating table. Now mind your mother, and stand up straight! 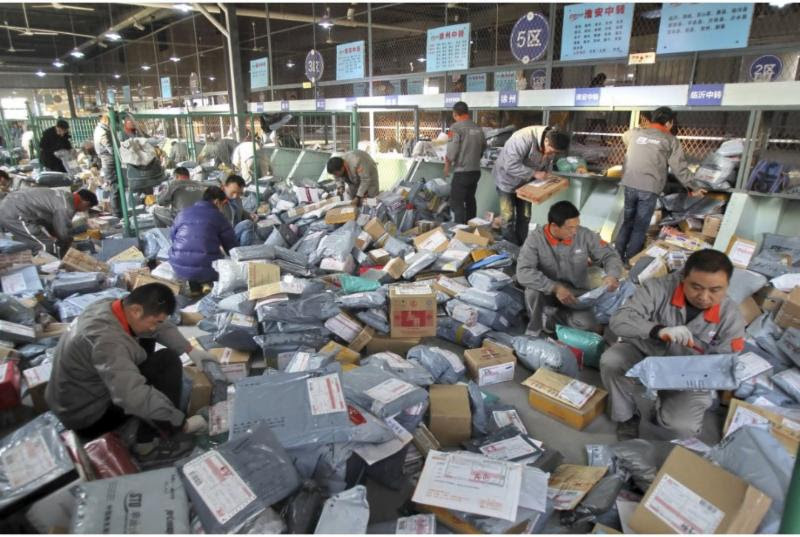 Alibaba, the largest online retailer in China, broke a record by selling nearly $10 billion in goods on Singles' Day (the anti-Valentine's Day holiday), the world's largest shopping day. Alibaba far surpassed America's e-commerce record of $3.7 billion in orders from last year's Thanksgiving day, Black Friday and Cyber Monday, combined. 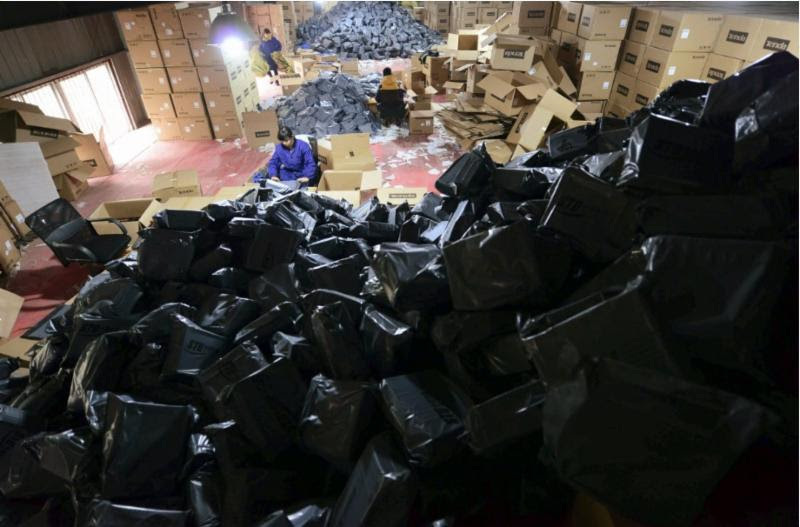 Follow the link for more images of Alibaba's insane sales day. The next time you complain about being under a mountain of work, at least it's not literal! The guys over at Information Is Beautiful correct some of the most widely held misconceptions and their virulence. How many have you fallen for? Or are you one of those super smart people who uses far more than just 10% of your brain? Follow the link for all 52 points you've probably gotten wrong. 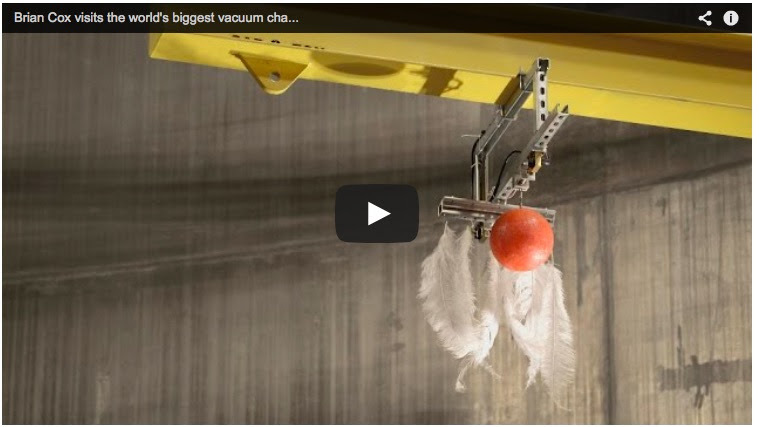 What happens when you drop a bowling ball and a feather at the same time? Well that depends. In normal air, a bowling ball and a feather will drop at the rates you'd expect. But what if air - normal Earth conditions - is removed? Well then you see the true nature of gravity. And in true gravity, are these objects even falling at all? Watch and learn in this must-see video. In 1968, Apollo 8 astronauts Frank Borman, Jim Lovell and Bill Anders were the first humans to orbit the moon - and to witness "earthrise." 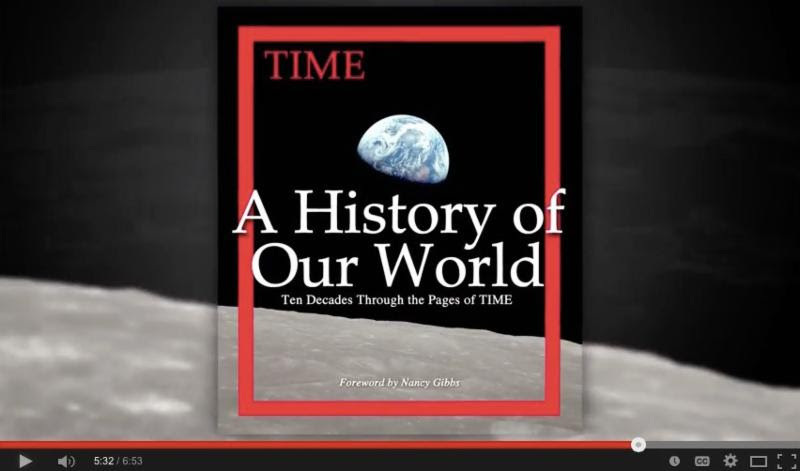 Thanks to technology and new data from NASA's Lunar Reconnaissance Orbiter, NASA was able to recreate for this stunning video earthrise exactly as the astronauts saw it. Watch and imagine what it might feel like to see Earth rise above the moon's horizon. This cool, interactive site allows you to search any zip code and see data about it, like age range and income of its residents compared to surrounding areas and the country. Esri also tells you the percentage of renters, singles and married couples and the behavioral patterns and psychographic profiles of each segment. It's a great way to kill some time on a lazy day. We hope you enjoyed this issue of TLV! Now it's time to turn your attention to football. Or a nap. Or some combination of the two. No one really reads anymore, right? will wonderfully tone up the mind and body."